home .Featured, Infectious Diseases Are ‘germ-zapping’ robots useful in fighting hospital acquired infections? Are ‘germ-zapping’ robots useful in fighting hospital acquired infections? Well, I confess, I am still a bit skeptical of the utility of the “germ fighting robots” of various kinds that keep getting promoted as being useful at various health care facilities. There was a story published today in our local major paper – the Sacramento Bee that discusses this topic. Germs that cause hospital-acquired infections are a stubbornly difficult problem for hospitals, which are continually seeking better ways to banish bacteria and germs that can be killers. Sutter Medical Center in Sacramento showed off its first-ever “germ-zapping” robot, a wheeled machine that emits pulsating ultraviolet light that’s been shown to kill off infection-causing bacteria. Source: Sutter’s ‘germ-zapping’ robot latest tool to banish deadly hospital infections by Claudia Buck. The article does a decent job of presenting the concept and some of the possible benefits but also some healthy (and I would say well deserved) skepticism. The concept at the big picture level makes sense – bring in a robot to help kill microbes – especially in rooms or locations where people who are prone to healthcare acquired infections (HAIs) might be found. The skepticism I have relates to two things. First, do these robots when used in the real world actually kill a lot of microbes? And second, does killing microbes broadly help limit HAIs. For example, it seems possible that killing microbes could have complicated effects on HAIs since some microbes being killed might be beneficial in some way). See the article for some useful skepticism from Dr. Gregory Maynard – the chief quality officer for the UC Davis Medical Center in Sacramento (for full disclosure – I have a half appointment at the UC Davis School of Medicine – although I have never had any significant interactions with Maynard as far as I remember). 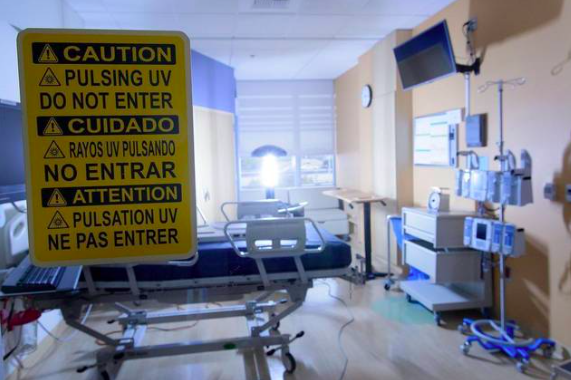 Sutter is the first hospital in the Sacramento area to deploy the anti-germ robot manufactured by San Antonio-based Xenex, one of several disinfecting UV robots on the market. The company says its robots operate in about 40 California hospitals, from California Pacific Medical Center in San Francisco to smaller facilities such as Valley Children’s Hospital in Madera. The $100,000 robots can quickly pay for themselves in treatment costs, according to Sandberg, Sutter’s environmental services director. In a previous position at an out-of-state hospital, Sandberg said the use of a fleet of four robots dropped C. diff rates by 40 percent in three months. That translates into cost savings, she said, noting that hospitals typically spend $15,000 to $50,000 treating patients who are readmitted with C. diff infections. I personally would really like to see more data from the hospitals on these “germ killing” robots before being convinced that they help significantly.